100% UVA and UVB Protection - UV PROTECTION: Not only do these glasses provide cute style, but they also shield harmful UV rays from your little one's sensitive eyes. 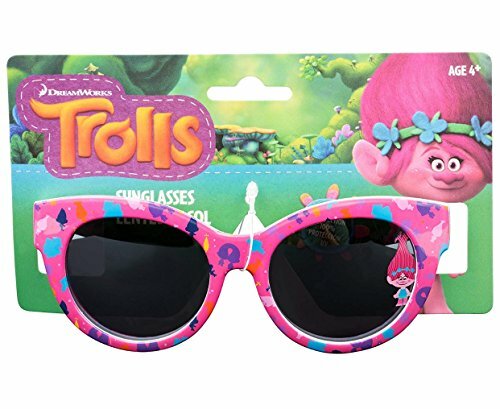 Sturdy construction with pretty, vibrant colors - KID-PROOF: Lens and frame are both made of child-proof plastic, making these sunglasses durable and lightweight, which is perfect for your active kid. Shatter-Resistant Lenses - EYES WIDE OPEN: Non-polarized lens offers a dark cooling shade that protects young eyes, while reducing glares and squinting in the sun. Age 3+ - ONE SIZE FITS ALL: These sunglasses comfortably fit all children, ages 3 - 10.